Product #32066 | SKU 010.AS.024 | 0.0 (no ratings yet) Thanks for your rating! 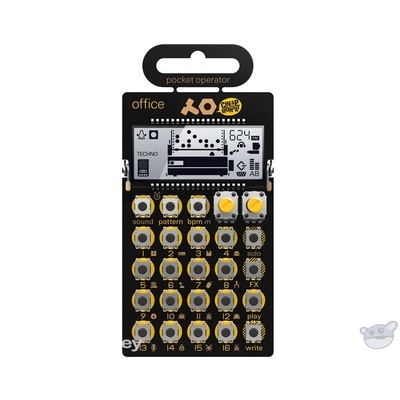 Small enough to fit in your pocket and powered by a pair of AAA batteries, the Teenage Engineering PO-24 Pocket Operator Office Synthesiser features the sounds of office equipment with 16 punch-in effects including aliasing, overdrive, repeat, filters, distortion, glitches, and noise. The synthesiser parameters can be locked, while a 16-step sequencer, which holds 16 patterns in memory, can be chained into a song with up to 128 patterns. An integrated clock and alarm clock expand the creative possibilities of the instrument. A jam-sync function with 3.5mm audio in and out connections allows for multiple synthesiser units to be linked together. Using high-quality components with low-power consumption, the synthesiser is cleverly designed with a Silabs EFM 32 Gecko CPU, a Cirrus Logic DAC, and a Knowles speaker placed under a novel animated LCD on a single circuit board. A foldout stand makes it easier to play and rear panel speaker solder terminals allow you hook up the unit to a larger sound system. An optional tailor-made silicone pro case (sold separately) adds anti-slip feet, battery protection, and professional-feel buttons to this very unique music-making device.